Sometimes I try to venture down south and get in touch with some of the top runners and coaches in that area. Today we are very lucky to hear from one of the best runners in the southland who just had a remarkable junior season, Arcadia HS runner, Ammar Moussa (pictured to the left, courtesy of www.insidesocal.com). He won the ultra competitive Mt. SAC Invitational with the fastest time of the weekend, 14:34. He also won the state meet Division I race with the fastest time of the day (14:59) while leading his teammates to a 3rd place team finish. Ammar went on to finish in 4th place at the Nike Team Nationals trailing only Elias Gedyon of Loyola (2nd place) in the battle for top runner in CA. 1) How did you get your start in running? What other sports have you done? My interest in the sport of running kind of started my 8h grade year when I decided to run the local city track meet. 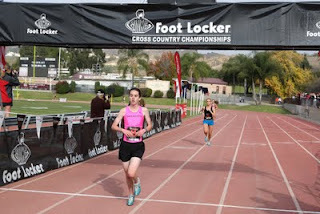 I ran the mile and I won with a PR, and I got to move on to the next two races running PRs in both and competing well. For most of my life I've played soccer and basketball, both at club levels. 2) When did you first realize you had the talent to do well in the sport? I first realized that I had the talent to do well in this sport when I won my first race as a freshman at the Bosco Tech Invite. It was an eye opener and convinced me that I might have a chance to compete in this sport. 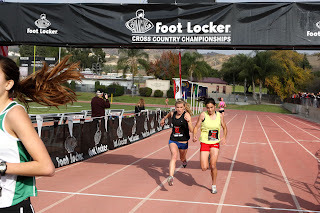 3) Describe some of your best races during your freshman and sophomore seasons in cross country? Some of my best races as a freshman were running with the varsity squad for the championship season. Just being in such high level races and competing for the team really made me love that part of the season and led me to some good times. 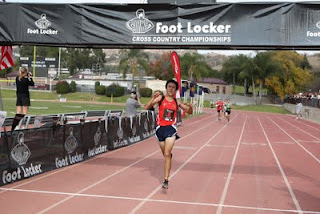 During my sophomore season my best race was at Clovis Invite. I really just went out there and put it all out on the line during that race, and ran a really good time that helped my team to a 3rd place finish there against some really good teams. 4) What runners did you look upto during those seasons (on your own team or other teams)? During my frosh season I really looked up to German Fernandez (who didn't?) and my teammate Renaud Poizat. I really admired German's ability to go out and race hard every time and how he was able to just attack records and not be scared to do it. I looked up to Renaud both freshman and sophomore years. He was (and is) and amazing athlete, but it went beyond that. The way he carried himself around, and the way he led the team really serves as a model for aspiring athletes. 5) When did you first realize that you had the opportunity to be one of the best runners in the state? I first realized that I could really compete with the best runners in the state at Mt. Sac Invite sophomore year. I finished sixth that day and number 2 in my grade behind Elias, and after that race, in the back of my mind, I was thinking, "Wow, I can go after it next year." 6) Tell us about the 2009 state meet 3200. What was your plan going into the race and how did the race unfold for you? The simple opportunity to qualify for the state meet in two events was incredible in itself. But what was more incredible was the atmosphere in the stadium that night. My plan going into that race was to not go out with the leaders and to move up during the race. My plan didn't go so well, because that kind of racing style is not something I'm used to, and I wasn't able to execute correctly. I moved up as much as possible, and I can't say that I'm disappointed with the result, but it was a huge learning experience. 7) What is your favorite race/invitational? Course? Opponent(s)? Workout? Run? My favorite race is the state meet for cross country. 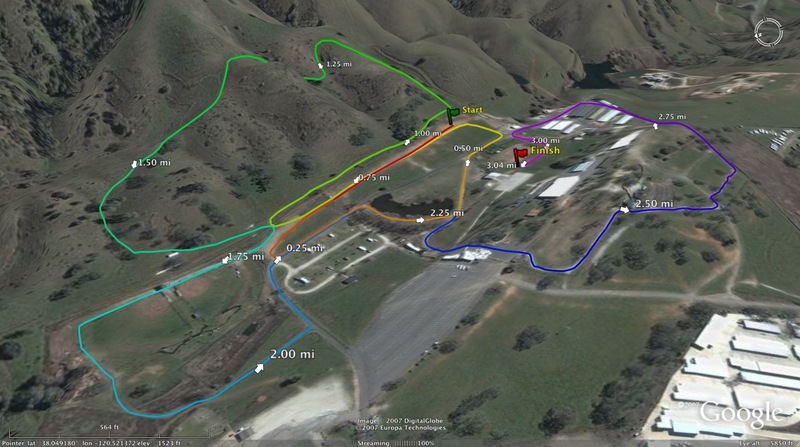 I love a race where everything is the line and there is no room for error. My favorite course is Mt. Sac because I love the challenge. My favorite opponent is any one that is willing to race hard and not give up. That includes guys like Matt Mcelroy, Heyden Woofe, Justin Vilhauer, and Elias, the rest of those guys. They all get out there and race, and its fun to be there racing them. My fave workout is 5x1000s because it gets me feeling fast over a race distance. 8) Tell us about your coach and what he has meant to your success? My coach has been huge for me. He continues to make me more than a good athlete but also a better man and leader. Those two things are more important than all the titles in the world combined. 9) What does a typical week look like for you during the summer in terms of training? Early XC season? Middle of the XC season? Late XC season? During the summer, training typically consists of two-a-days Monday thru Friday, averaging 80 mile weeks. We go from 70 mpw early in the season to 50 or so during championship season. We don't start faster repeats until later in the season, as we need more of that snap in our legs during races. 10) You past cross country season, what are some of the accomplishments that you are most proud as you look back? The accomplishment that I am most proud of from last cross country season was standing on that podium with the team at the State Meet. We left Woodward Park in 2008 and we made a promise to each other that we would try to win the next year. That was the goal the entire season and we ran every mile of the season with a state championship in mind. Though we didn't win state, being third in the best division in the state was still an amazing accomplishment, and just being on the podium with the guys was amazing. I'm also proud because I was able to win the state meet, and it kind of got that bitter taste that I had in my mouth after my performance in 2008 at the state meet. That race was my personal motivation for an entire year, because I knew that I had let down my teammates, my coaches, and myself that race, and I wanted to make up for it. 11) As you turn your attention to the track and field season, what races are you most looking forward to in 2010? I really want to thank everybody who supported me this season, especially my family, my teammates, my coaches, and my classmates. I pray to God that I continue to have that kind of support for the rest of my running career, and I pray to God to give me the same and better results for upcoming seasons. Thank you. Thank you very much Ammar. AJC. With all the top 10 lists posted online, it's only fitting that I post the top 10 top NorCal XC runners for this past decade. I have to do a little research before I post the final lists but if you would like to post your own lists, feel free to do so in the comment section below. I am only looking at what runners did during their high school career and during cross country season only. 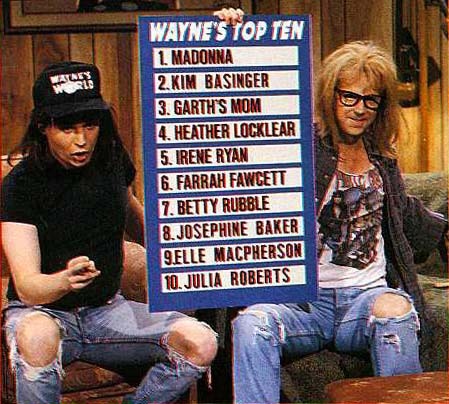 Those lists will be posted in the next few days. The All-NorCal teams will be posted as well on www.lynbrooksports.com in the next week or so. Comments on either lists are always welcome. Coach Tim Bruder remembered for impact on students’ lives. A week after the death of Alhambra High School coach and teacher Tim Bruder, a Facebook page dedicated to his memory has attracted nearly 800 members and almost as many testimonials to his prodigious popularity with students and colleagues. Entry after entry chronicles the positive, lasting impact Bruder had on the legions of teenagers who crossed the threshold of his auto shop classroom or joined the Bulldog track or cross country running teams over the past 24 years. A memorial is scheduled for Dec. 19 at 4 p.m. in the AHS gymnasium. Bruder, 54, suffered from diabetes and a kidney disease. Fellow AHS teacher and close friend Jay Heeb said Friday that Bruder had been ill for the better part of a year, although he did not miss any workdays or lag in his coaching duties. AHS administration and Heeb confirmed that Bruder was hired in 1985 by then-principal Pat Gemma. In addition to teaching Auto Shop and coaching the running teams, for a time Bruder also coached the girls’ soccer team. Nauset Regional athletic director and boys basketball coach Keith Arnold sees it every day at lunch. He walks into the school cafeteria and watches students walk past the healthy choices on the menu and head directly to the kinds of foods that make nutritionists cringe. Most high school athletes understand the importance of proper nutrition and how it can improve their performance on the field. The challenge for coaches and teachers is convincing them to follow it. “They're aware of it, but that doesn't mean anything,” says Nancy Clark, a sports nutritionist and author of “Nancy Clark's Sports Nutrition Guidebook.” “It needs to be emphasized that if you have an empty gas tank, you're not going to get too far. Arnold believes it's imperative that schools focus on educating student-athletes on nutrition so that they view it not only as an avenue to improved performance, but as a long-term lifestyle. “We have the tools,” he says. “Right now, I see that there's a basic foundation of knowledge of what they should and shouldn't be doing. But I also see the fact that they are teenagers, and they thrive on those other types of foods. Who is going to break into those top 10 lists this coming Track and Field season? Keep the comments coming about who you feel belong on the All NorCal XC Teams. You can also email me at albertjcaruana@gmail.com with your choices. Include their first and last names as well as their school, section and accomplishments from this past season. Would love to hear your input on what runners belong on the All NorCal XC Team. Hank Lawson of www.lynbrooksports.com is once again compiling a list of the following. Feel free to include a list of the runners that you feel belong on the team (boys and girls). We also pick a ALL-FROSH TEAM which consists of ten athletes so pick those folks as well. Please also identify the Frosh, Soph, Junior & Senior RUNNERS OF THE YEAR and your OVERALL Runner Of The Year. Today we chat with San Francisco City College coach, Marc Dyer. His men's cross country team this year won the Coast Conference and NorCal Community College Championship. They finished in 4th place at the California State JC championship meet, the school's highest finish ever. Marc is a former CCSF runner who also attended high school in San Francisco at Washington HS. This year, his xc team consisted of local runners who were able to extend their running careers at the junior college level while keeping their hopes alive of competing at four year colleges. Marc has done a terrific job in his short time at CCSF and I thank him for taking the time to answer my questions for this interview. 1) What was your running background and how did you get started? My dad used to run for fitness and his one of his good friends ran cross country and track for USC. Seeing them run got me interested in the sport when I was younger. My actual running career started sophomore year at Washington High School in San Francisco. I was like most SF public school kids, I ran about 4 days a week and only ran during the season. I ran cross country my sophomore, junior, and senior years. My senior year I got a little more serious about running and ran track for the first time. 2) Tell us about your own running in college? I ran cross country and track at City College of San Francisco. After CCSF I transferred to Cal Poly Pomona and was able to walk on to the team there and continue my running. In track I ran the 3000m steeplechase and 5000m. Being part of two very different teams helped me learn a lot about the sport and different training systems. At CCSF we ran lower mileage higher quality. Cal Poly Pomona was higher mileage training. My experiences as a transfer student heavily influence the training my athletes do today. 3) How and who inspired you to coach? My coaches at CCSF were the ones that encouraged me to get into coaching- Adam Lucarelli, Sean Laughlin, and Doug Owyang. My freshman year at City I was trying to figure out what I wanted to do with my life. I knew I liked running but that was about it. I saw how much those guys enjoyed coaching and I knew it was something I wanted to do. 4) When you first started coaching, who did you consider to be your mentors? Adam, Sean, and Doug were my early mentors. Tony Kauke and Al Berrin have also given me some great advice along the way as well. 5) What was the state of the CCSF cross country and track and field (distance runners) teams? Right before I started at CCSF the men's track team had won three consecutive state team titles (2004, 2005, 2006). 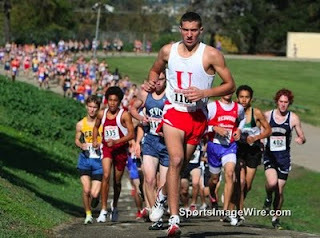 The men's and women's cross country teams also had some success placing third at nor cal and ninth in the state in 2004. Tony Kauke, who coached the mid distance/distance runners before I started, really laid the foundation for the success that we are having today. 6) How many years have you coached at CCSF and what are some of your team's accomplishments? I'm in my third year coaching at CCSF. Our men's cross country team placed fourth in the state this year(CCSF's highest finish ever). We've won our conference championships the past two years and we've won the nor cal championships the past two years. On the women's side we have qualified to the state meet twice as a team(07, 09). Our highest conference finish was second(07) and our highest nor cal finish was fifth(07). We have also had a number of all conference and all nor cal runners as well. In track we've been pretty successful and have had numerous state qualifiers in the distance events. Last season Chris Gerber finished second place at the state meet in the steeplechase(only his second season running track!). 7) Tell us a little about this year's team (high schools they attended) and some of their accomplishments? I'm very fortunate to have such a dedicated and fun group of athletes to work with. We have athletes from June Jordan, Lincoln, Mercy, Redwood, Riordan, School of the Arts, Terra Nova, Washington, and Westmoor. Our sophomore guys who led us to two conference and nor cal championships were 10:04-10:33 3200m runners in high school. They've been very consistent and have improved quite a bit since high school. All Conference Cross Country- Danielle Juarez(08,09), Sloane Cook(08, 09), Fernando Diaz (08), Luke Frazier(08, 09), Mark Frazier(08, 09), Benny Willers (09), David Urista (09). Most improved- Benny Willers. Benny ran 10:26 in the 3200 at Riordan. 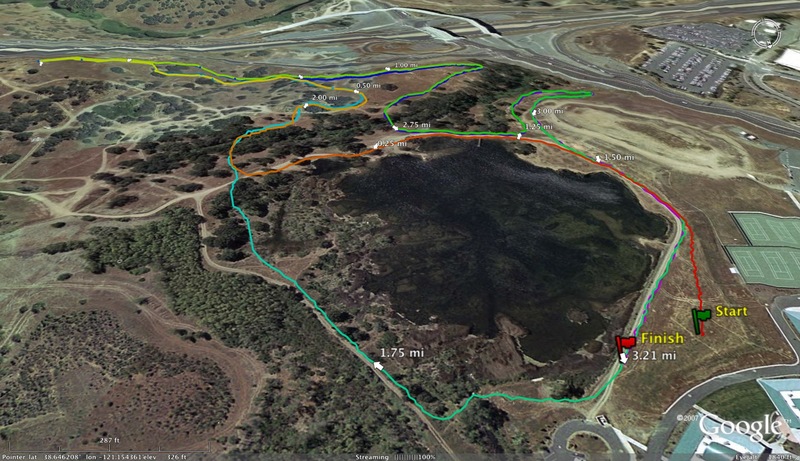 This season he ran 5:10 pace on the Crystal Springs jc course (4.2 miles)! 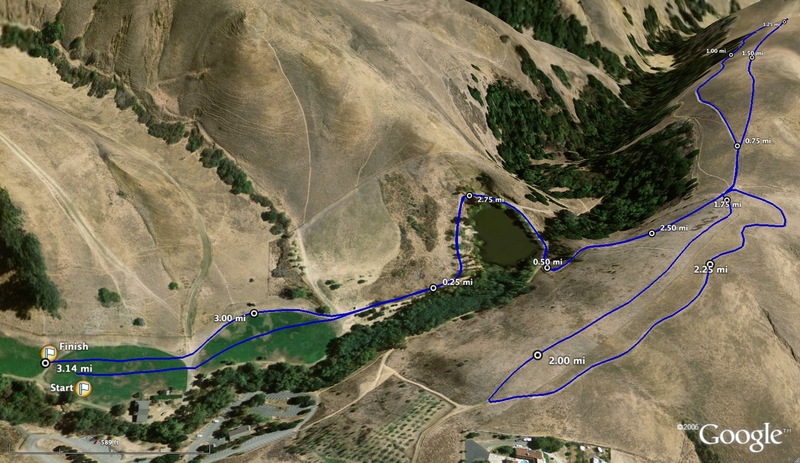 His high school best at Crystal Springs was 16:31(5:36 pace). 8) What so you think are some of the differences with coaching athletes for only two years in the junior college level as opposed to four years in high school or at one college? I don't think there is a difference in terms of training. It would be great to coach these athletes for more than two years, but we take a lot of pride in seeing them transfer and compete at the four year level. 9) What are some of your selling points in convincing high school runners to attend your school? Our main points are that you can get two extra years of development as well as saving a lot of money. You can become a much better athlete in two years, and on top of that California junior colleges are only $26 per unit. For two years of school you are spending less than $2000, that's a great deal! 10) Tell us a little bit about your training program. Mileage for freshmen? sophomores? running areas? favorite cross country workouts? 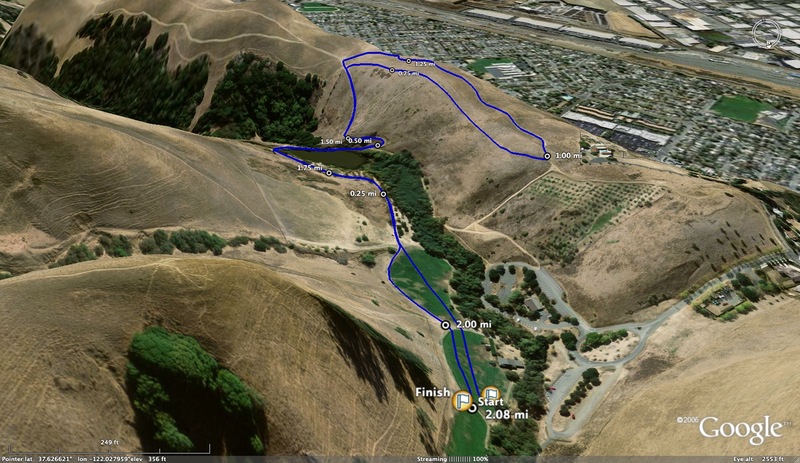 Our main training areas are Golden Gate Park and San Bruno Mountain. Mileage is different for each individual depending on your high school background and durability. Our lower mileage guys run 40-50 miles a week, our higher mileage guys run 70-80 miles per week. We also follow a strength training plan that our jumps/hurdles coach, Greg Bianchi, put together for us. Our cross country training is pretty simple. During the week we have three main workouts- a tempo run, intervals, and a long run. Our other days are pretty easy mileage. Tempo sessions are 4-5 miles for freshman, 5-6 for sophomores. These will be either mile repeats with one minute rest or a continuous run. We always finish off our tempo workouts with 4x200m or 3x300 @ 1500 effort. We use the Daniels vdot tables to establish tempo paces. Our interval workouts are either 800s, mile repeats, or timed fartlek runs (ex. 8x3 min hard with 2 min jog recovery). Long runs are 90 minutes for the freshman, 2 hours for the sophomores. 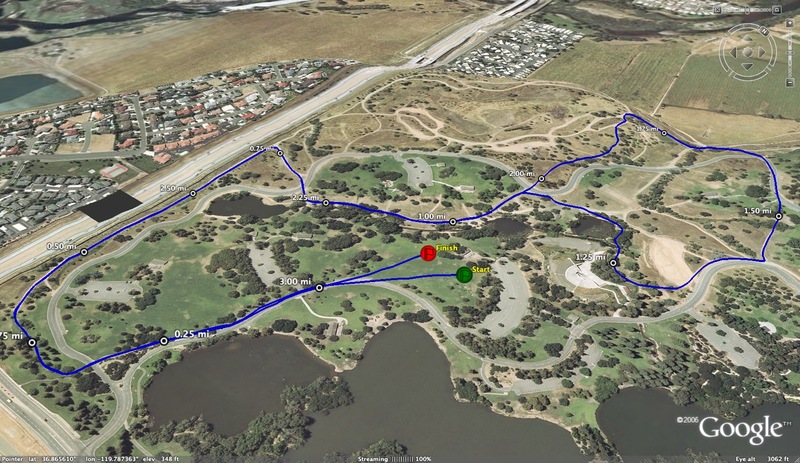 My favorite cross country interval workout is the one we do at Stow Lake in Golden Gate Park. We start off with 4x800m on a 4 min cycle, then do 4x500m hill repeats on a 3:30 cycle, then back to 4x800m on a 4 min cycle. 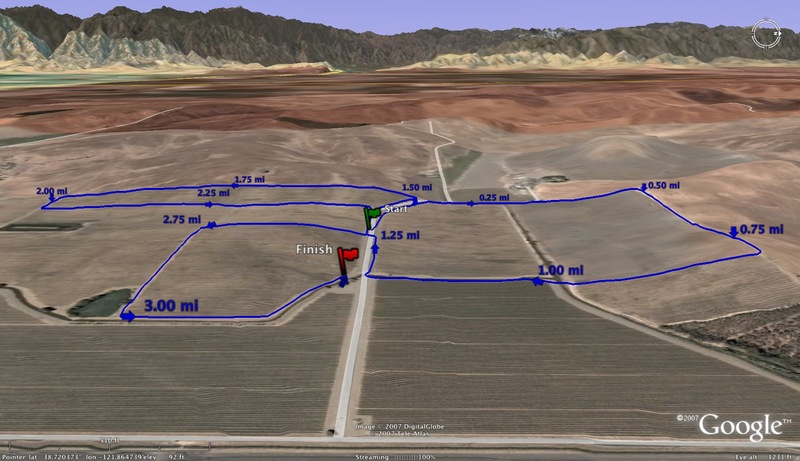 This workout does a good job of simulating our cross country races. During track we up the intensity a bit. 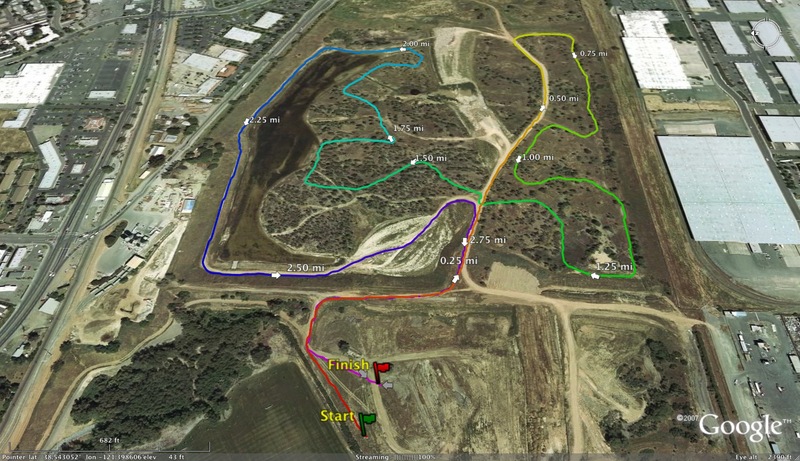 We'll start the season with a tempo run and a fartlek workout on our cross country course once a week. As the season progresses we start getting event specific. The athletes will break up into their event groups- 5k/10k, 1500/steeple/5k, and 800/1500 and we'll go from there. 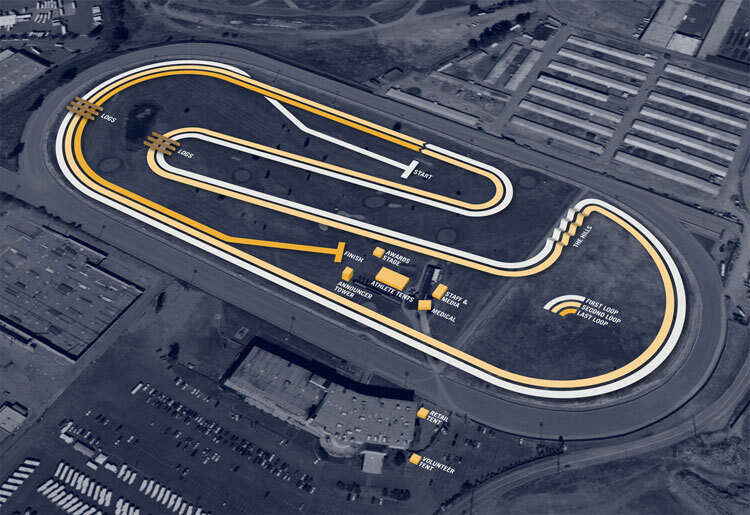 Everyone will spend time training at paces above and below their race distances. 11) What is it going to take for Northern CA junior college programs to compete with the junior colleges down south? I think the nor cal teams are doing a good job of competing with the south. Our team time at the state meet this year would have placed us third in 07 and 08, second in 02 and 03, and we would have won in 05. In 04 and 06 we would have taken fourth. This year at state the north did pretty well placing four teams in the top ten in both men's and women's races. In addition to that the north had the men's state champ, Danny Tapia from Hartnell College (North Monterey County High). You can follow California community college results on norcalstat.com(nor cal), gocollegetrack.com(so cal), and directathletics.com(performance lists). Looking for a 5K run? 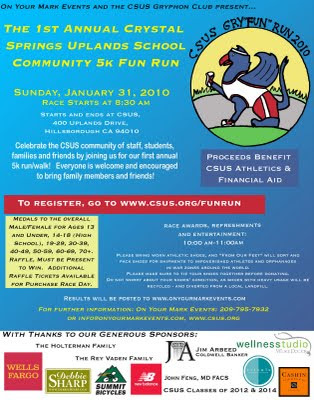 Crystal Springs Uplands School will be hosting the 1st annual Gry*FUN* Run which will take place on Sunday, January 31st at 8:30am. 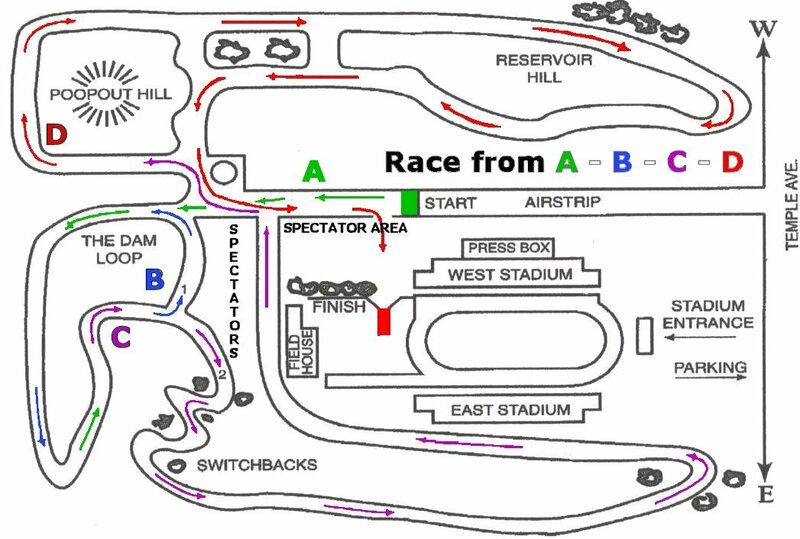 The start and finish will be on school grounds in Hillsborough. If you haven't seen this article already, check it out. Great story about our sport. Of all the stories coming out of last Saturday’s 6th Nike Cross Nationals high school championships in Portland, Oregon, the one that remains to be told is that of a boy and his brother, the ravages of fate, and a courageous run at the back of the pack. It was Albuquerque Academy's fifth appearance in the national event, which invites 22 boys teams and 22 girls teams based on regional qualifying meets and at-large selections, as well as individual qualifiers. Each race totaled 199 runners. Like most contenders, Albuquerque, which had placed as high as 3rd in 2007, began training in earnest over the summer. With a number of key runners returning from the Chargers’ 11th-place team in 2008, and young talent moving up, the head coach, Adam Kedge, felt that Academy might have another shot at victory. But in late July, as the boys were putting in their base mileage, it was learned that the brother of team member Neil Longenbaugh, a junior and third scorer at NXN in ’08, was seriously ill. Nick Longenbaugh, a year older than Neil and a 2009 Academy graduate, was diagnosed with leukemia—specifically, acute myeloid leukemia, a rare, virulent form of the disease. AML is characterized by the rapid growth of abnormal white blood cells that accumulate in the bone marrow, interfering with the production of normal blood cells. “We’re really close so it was hard,” Neil told me the day before NXN. After Kedge and Academy assistant coach Alan Vraspir had apprised me of the situation, I asked if Neil would agree to discuss his thoughts. The coaches checked with Neil and he said yes. Neil continued with summer base work as Nick was first admitted to the University of New Mexico Hospital in Albuquerque for tests. An exceptional student, Nick had played soccer, run cross-country for a season and graduated with accolades. He was accepted to Harvard and after the diagnosis his admission was deferred for a year. Please email Chris Puppione to let him know that you would like to attend at cvpuppione@yahoo.com. Don't miss out on this exciting opportunity. Today's interview was done SF University's #1 runner, Ned Tannenbaum, following the NCS Meet of Champions meet at Hayward HS. UHS won their 11th NCS title in the past 13 years. Seems logical that they won again this year until you realize that they graduated 6 out of their top 7 from the previous season and 4 out of their top 5 scorers at the NCS meet this year were freshmen. Ned led the way for the young Red Devils as they went on to finish 5th at the CA state meet and will be contenders to win that meet next year with their top 7 back. 1) How did you get started in running? My middle school, Marin Country Day school had a pretty big cross country team with a lot of kids from grades 6-8. My older brother had enjoyed running there and was running for UHS at the time. Most kids went out for a sport in sixth grade, and I wasn't too good at soccer, so I joined the team. Many of my teammates from those teams have run or are currently running for UHS. The team was pretty relaxed in terms of workouts, but I enjoyed racing, and seeing my gradual improvement each year. In my final year, when I started to get in better shape, and became a leader on the team, I knew that it was something that I wanted to pursue. 2) What other sports have you done before and while at SF University? Through the eighth grade, the only running I did was during the two months in the fall. Baseball was my primary sport, and I played basketball in the winter. Originally, I had planned on playing baseball at UHS, but as middle school came and went, so did my interest. I have continued to play basketball the past three years. It gives me a little break from running, and keeps it fun. 3) Who were your mentors on the team during your freshman and sophomore seasons? What did you learn from them? The class of 2009 had a bunch of great runners. Each of them offered something different. Robert and David Kealhofer were both extremely dedicated to improving and motivating me to keep working hard. Robert liked to remind me that he was unable to break a six-minute mile as a freshman, but with a lot of work during track season, and consistent summer training, was running in the 16:20s during his junior and senior seasons. David always relentless in getting me to run with him, and on multiple occasions, I was surprised to find him in my house after I had missed his phone calls and texts. Weishen Mead is just fast. He always put everything he had into workouts, often finishing 16x400m workouts with 61s and 62s. He PR'd 5 straight weeks last track season in the 800, taking a second off each week, culminating in a state meet berth, and an impressive time of 1:55. I credit the attitude I take towards my training to these guys. 4) Tell us a little about some of the traditions on the University HS xc team. Why do you think UHS has been so successful in xc? As championship season rolls around, the top seven get new singlets that they get to keep. They are white with a red "U," and something that most young guys look at as something to strive for as indication that their hard work and training has paid off. Also, the unwritten rule is that if it's sunny, its an No Shirt Day. For one, because everyone likes the sun, but mainly because no one likes tan lines. 5) Tell us a little about your summer training this year and the running camp you attended. My summer training for cross country is interwoven with University's summer basketball program. For most of June, I was running around 40 mpw, and had a basketball practice or a game most days. In early July, basketball died down a bit, and I reached 50 miles the first week of July. I attended Cross Country Base Camp in the Marin Headlands. It is run by Sacramento State Coach, Scott Abbott, and a handful of the Sac State runners. It's a four and a half day camp with a variety of workouts (Long run, hills, fartlek, gradual climb), and features multiple speakers with info about training, shoes, nutrition, and running at higher levels. For the past couple of years, it has been a great motivator for me to get in shape early on in the summer. 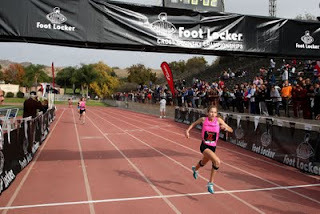 6) Last year was your first experience at the CA state xc meet. What do you feel that you learned the most from the meet that will help you in the next two years? Many people tell you that you have to be careful that you don't go out too fast, but if you go out too conservatively at a meet with so many runners like the state meet, it's easy to fall into a rhythm, and get lost in the pack. Go into the race with a plan and assert yourself early. In terms of preparation, you have to treat it like any other race. 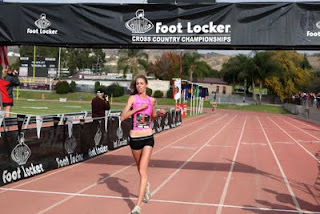 I got pretty nervous, and stressed out the before the race, which disrupted my usually pre-race routine. If you remember to be happy that you are there, to do what you normally do, and to stay focused, you are more likely to be successful. 7) What does a typical week look like for you in terms of training during the early part of the season? Mid-season? Coach Tracy's training program is a low-mileage, speed-based system. He doesn't require miles upon miles of summer training, but asks that we do what we can to build up a strong base for the season ahead, while doing all that we can to avoid injury. During the first couple weeks, we basically extend our summer training. We don't have speed workouts, and mainly do runs from 5-8 miles. I usually reach my season high for mileage during these couple of weeks. After those initial practices, we begin our normal schedule that lasts until the end of the season. We run distance intervals, breaking up our race distance into multiples of 400s, 600s, 800s, and 1000s, usually doing enough reps to reach our race distance, with the exception of 400s, in which we occasionally do 16. The repeats are done with rest in between. 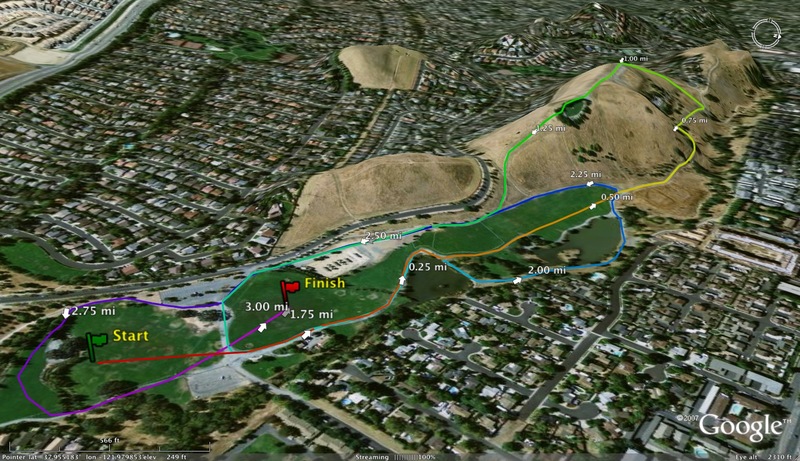 UHS is conveniently located next to the Presidio, and there are plenty of trails for us to run these workouts. We normally have 2 or 3 of these workouts per week depending on whether we have a race that week. 8) What changes for you and the team as you guys approach the league final, ncs and the state meet? Our training schedule continues on normally. We have the same amount of interval workouts and recovery runs. Coach Jim gradually decreases our rest from the very beginning of the season, adjusting the workouts to our rising level of fitness as we approach more important meets. 9) How has your coach, Jim Tracy, helped you improve as a runner? What do you feel are his most important contributions to the team that allows you and your teammates to be so successful? Jim Tracy always makes sure that we understand the benefits of each workout. He feels each separate workout gives us a new way to perceive a race. 400s break it up into bursts of speed, 1000s help us gather understanding of how to approach a 5k. Along with this, Jim is observant. He is also very honest. If he notices something that needs improvement, he will let you know loud and clear. Along with keeping our race times and improvements from year to year, he keeps records of our interval workout times, charting our progress throughout the season. His goals for the team and the individual are always clear, all owing us to improve on both levels. 10) Redwood Christian was the favorite going into this season to win the NCS Division V race. When did you feel like your team had a chance to winanother NCS title? I have to admit that after last season ended I didn't expect an NCS championship. I was more focused on a league title at that point. We graduated 12 of our top 14 runners, and I was the only returner in the top 7. But when practice started in August, I saw that returning runners had managed to get some training in, and could not help but notice the huge freshmen turnout. From the get-go I reminded everyone that there were 6 varsity spots up for grabs, and whoever was willing to put in the work would have a place on the team. They were motivated and ready to dedicate themselves to getting better. After league champs was when I first began to notice that we were in contention for the NCS title. Our 2-6 runners had formed a strong pack at BCLs and I knew that if we had a strong couple weeks of training, and had a good race, that it was well within our grasp. The freshmen really stepped up at Hayward, especially Connor Clark who ran 16:24, improving 15 seconds on his mile pace from league champs. 11) With such a great group of freshmen as well as yourself, how close are the University boys from competing for a state championship? The almighty Southern Section seems to have 3 teams up front: Woodcrest Christian, Thacher, and Poly. The podium is definitely within reach, but it will take some solid performances all the way through. Our usual #3, Duncan Hosie, was a little sick on Saturday, and we are hoping that he can return to form. We have got nothing to lose, we have yet to crack the top ten in state rankings, so no one should be too nervous, and hopefully everyone will run to their highest potential. If we manage to form a solid pack with a couple guys up front, we have a good chance of being successful, but we will have to wait until Saturday to see. Happy Thanksgiving and good luck to everyone this Saturday! All teams that participated in the state meet merged. # on the left is overall place. El Molino High School is hiring Boys and Girls Varsity Track Coaches. Spots are filling up fast. Please contact Chris if you want to reserve your spot. We would love to see some new coaches this year. Contact Chris Puppione (cvpuppione@yahoo.com) for register for the event, as well as to receive further information. This event is for HIGH SCHOOL COACHES ONLY. Please contact Chris ASAP as spots are filling up fast. Some of the best coaches in SJS, NCS, and CCS will be at this Round Table. Don't miss out. Now that cross country season is nearly in the books and the track & field season looms on the not-so-distant horizon, we would like to invite you to join us for a clinic unlike any other in the state of California. 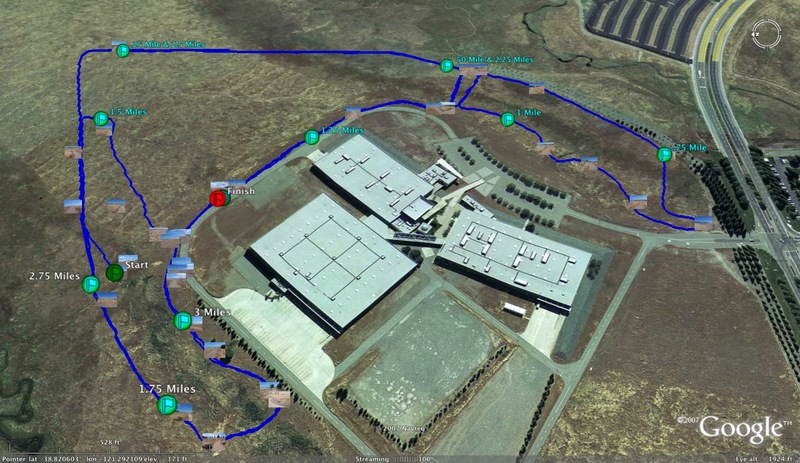 On January 9th, 2010, we will be hosting The NorCal Distance Coaches Collaborative Round Table in Hillsbrough at Crystal Springs Uplands School. The event is scheduled to kick-off at 9am and will be attended by many of the finest coaches from our part of the state. This clinic is unique in format and conception. 5. 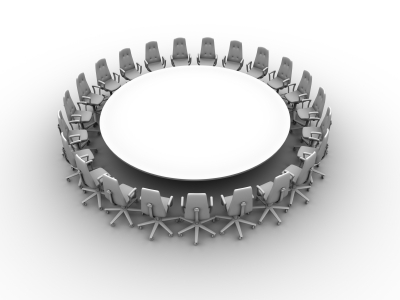 Sign-in on January 9th will begin at 8:30am with the round table beginning promptly at 9am. We will section the day into topics picked by our attendees, break for lunch at noon, and then reconvene for further discussion starting at 1pm. The round table ends when either you go home or they kick us out of the building at 3pm. Be a part of the excitement—be a part of the conversation. Join us January 9, 2010 at Crystal Springs Uplands School in Hillsborough, CA for The 2nd Annual NorCal Distance Coaches’ Collaborative Round Table. Thank you to everyone for your continued support of Tim Bruder. December 19th at 4 PM in the Gym. Hope you can all come." Again, thank you for your continued support of Tim Bruder! the Martinez Relays to the Tim Bruder Memorial Relays. ashes this spring at one of his favorite camping sites. Tim's three loving sisters are making all his arrangements"
an address for anyone wishing to send a letter of sympathy to Tim's Family. 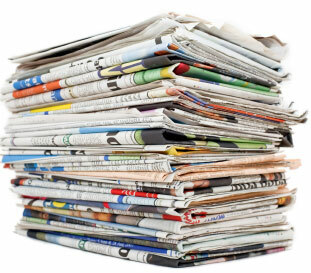 Did I miss an article that covered your team at the state meet? Send it to albertjcaruana@gmail.com and I will add it to the above list. As we head into the State Meet, I thought I would put the following teams out there for all of you to rank. In the comment section below, pick who you think are the 10 best teams and place them in order. 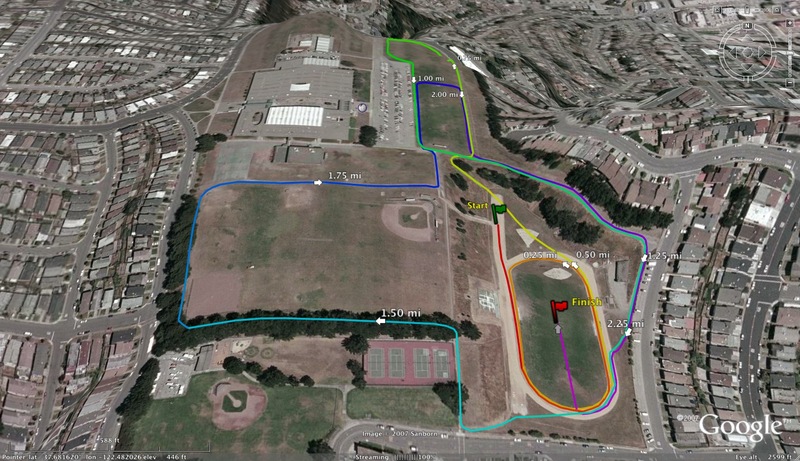 The Hayward HS (NCS)course and the Crystal Springs (CCS) course are fairly comparable in time in that they are about 20 seconds faster than the Woodward Park course. 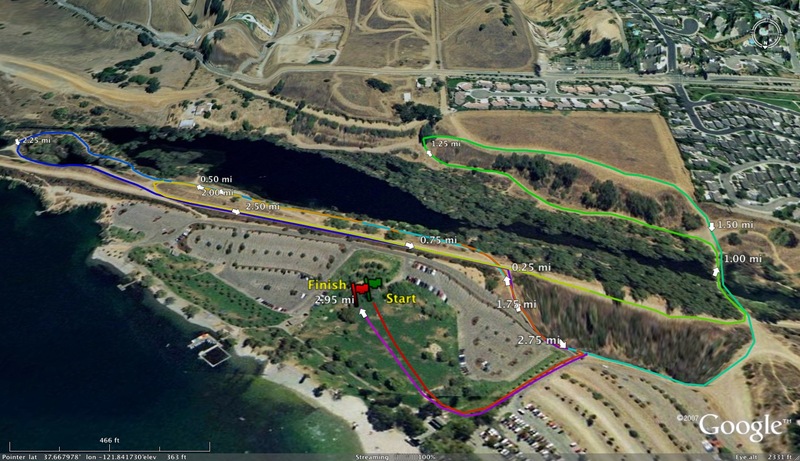 The Willow Hill Reservoir course used in the SJS meet is approximately 40-60sec slower than Woodward for the girls.